the 3rd fairway in Rancho Las Palmas c.c. Close to shopping, restaurants and casinos. Bring you clothes and toothbrush, you'll find eveyrthing else there. The condo has been remodeled to a more open feel. Fully furnished with all linens & cooking utensils. TV in each bedroom. Washer, dryer, DVD player w/surround sound, cable, natural gas bbq, short walk to pool area, across the street from The River for shopping, restaurants, & movie theater. Short drive to casinos. Use of owners golf cart. Seasonal golf memberships available. Everything was great. The place was super spacious for a two bedroom and Paul was super accommodating! We spent almost three weeks at the condo. The location, size of the unit is the best. Love the south east sunny mornings. I was disappointed with not being able to lock the sliding doors, the toilet kept plugging and over flowing and was finally replaced 2 days before we left. Plummer was amazing! Quick and cleaned up everything after the second flood. The windows were dirty and detracted from the view. Kitchen drawers need a good cleaning. The Kleenex boxes each had one Kleenex pulled out to make it look like there was more. One half of a toilet roll in each bathroom. Sheets well worn and difficult to find face towels. Option to use the transponder was not offered. Would be nice to have six dinning room chairs since the unit is meant to sleep six. Lucky we only needed 2. A little attention to detail could make this unit amazing. Sorry but I have to be honest so others can enjoy the unit to it’s fullest. Again, thank you for staying with us. I'm sorry it wasn't as pleasant as you may have expected. The plumbing issue was dealt with as soon as reported. The delay was a result of a miscommunication between the plumber and myself. The sliders do have locks and stoppers behind them. There are no longer transferable transponders. I will talk to the cleanig service regarding the windows. Nice home, great tennis, great location! We really enjoyed our two weeks here. The condo was very clean and well equipped. Very spacious and comfortable. Enjoyed the morning sun on the patio with a great view of the mountains. Nice central location. Very nice tennis facility. Paul was very accommodating and we would definitely return again. Thank you for the nice review. Glad you enjoyed your stay and look forward to your return. The space is open and set up conveniently, lot's of room, owner easy and accommodating to deal with. We keep coming back. Nice golf course view. Gated community. Condo very nice / well equipped. Pictures in the post don't do it justice. Definitely recommend. 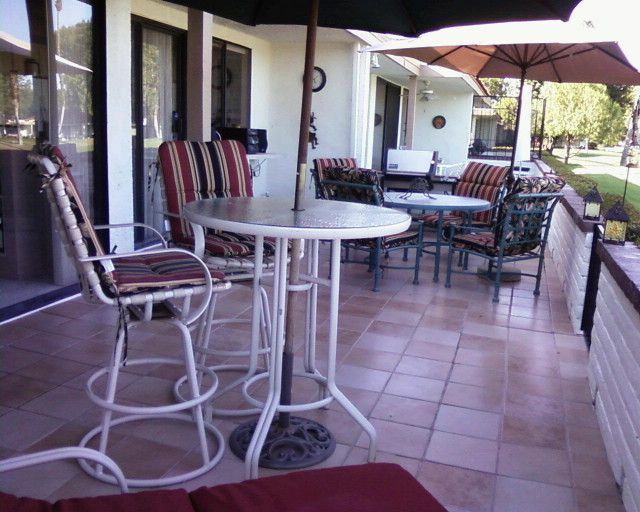 Clean, spacious, fully loaded and wonderful outdoor patio! A great 2 weeks staying in this centrally located condo in the best complex in Palm Desert! The condo was very clean and had everything you could need as far as condo amenities and complex amenities. Loved the patio in the late morning, early afternoon and evening. Beautiful! Thank you so much for the nice review. Very happy you enjoyed your stay. Weekly Rate: $750 - $1000 Monthly Rate: $2000 - $3500 $2500 mo. Oct.-Dec. $3500 mo. Jan.-May.$1800 mo. June-Sept. $750 WK June-Dec., $1000 WK Jan-May Utilities paid to $100. $100 non refundable cleaning fee. $500.00 booking fee/security deposit. $500.00 is due when condo is booked. It is fully refundable to within 60 days of scheduled arrival. After 60 days the money is not refundable. The booking fee is used as the security deposit. If there is no unreasonable damage or overages of the utilities it is returned within 30 days of departure.